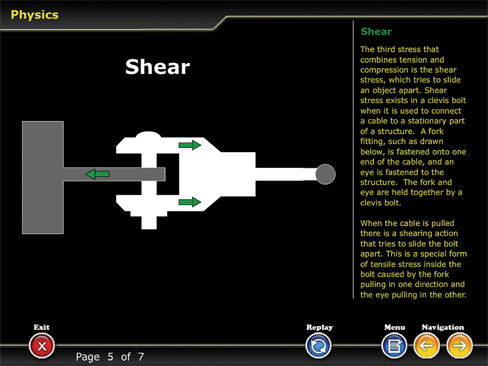 EASA 66 Module 2 explains the basics of Physics using easy to understand language and engaging graphics.The student will come away with a fundamental knowledge of matter, mechanics, optics and other topics that are necessary for understanding aircraft engines and systems. Elements of theory of stress, strain and elasticity:tension, compression, shear and torsion;Nature and properties of solid, fluid and gas;Pressure and buoyancy in liquids (barometers). Simple theory of vibration, harmonics and resonance;Velocity ratio, mechanical advantage and efficiency. a) Temperature: thermometers and temperature scales:Celsius, Fahrenheit and Kelvin;Heat definition. First and second law of thermodynamics;Gases: ideal gases laws; specific heat at constant volume and constant volume and pressure,work done by expanding gas; Isothermal, adiabatic expansion and compression, engine cycles, constant volume and constant pressure, refrigerators and heat pumps;Latent heats of fusion and evaporation, thermal energy,heat of combustion. Laws of reflection and refraction: reflection at plane surfaces, reflection by spherical mirrors,refraction, lenses;Fiber optics. Speed of sound, production of sound, intensity, pitch and quality, Doppler effect.